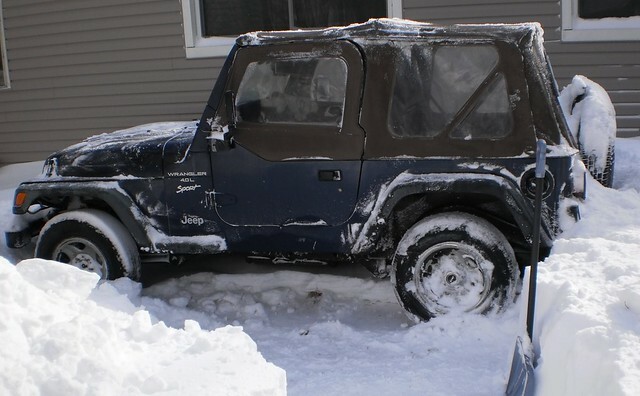 It took 2.5 hours but I shoveled off part of the deck, past the recycling can and then on to the Jeep, liberating that. There is a drift behind the Jeep that is up to the middle of the spare. I'm not going to work on that. I shoveled around the other three sides so when I can finally pull in, I don't have to always back in. There are times when the number of cars on the street prohibit easy backing in. I'm sore. I'm tired. I'm stuck here until I can dig myself free. 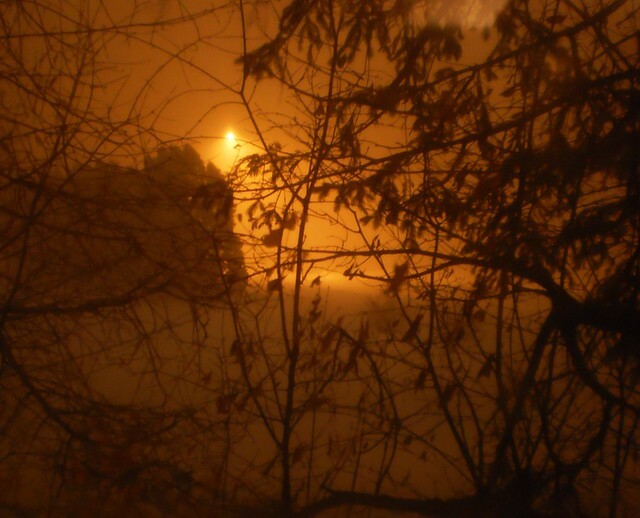 This is the view of my driveway looking toward the street. This was taken before I shoveled the drift you see at the bottom. It's over the front bumper of the Jeep. There is, at the south east corner of the house, a drift that goes from the front lawn, across the drive and into the neighbor's lawn. It's at least 4 feet deep and is, best that I can tell, 6 feet wide. That's a lot of cubic yards of snow that have to be moved. I have to do it by hand as I don't have a snow blower. So, I called my boss and he agreed that I could have the rest of the week off to get out of my drive. Fortunately, I have 3 days of vacation left from last year to use up. I was trying to think of when would be a "good" time but there really isn't. I would say Mother Nature made the decision for me. It wasn't bad shoveling today. The temps were in the 20's all afternoon. The wind was still around but it was dying down. Now the cold comes so shoveling tomorrow will be cold. My goal is to, in the morning, shovel this section by the house as it's not drifted. There's just a lot of snow. 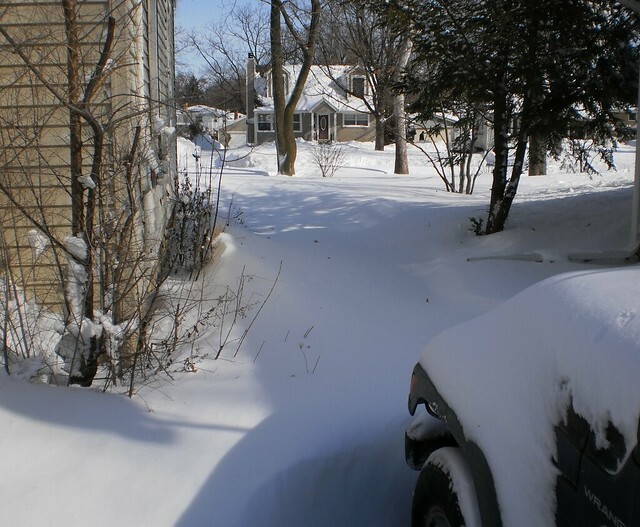 Then, in the afternoon, I will shovel a path to the left from the drive to the front door. I currently can't get there because there is a 4 foot drift across the steps. Friday, I will tackle the drift, as much as I can before getting tired. I still have Saturday and Sunday to finish the job. At 10:30 p.m. last night, it looked like this. I went to bed at 11:45 with the wind howling around the house. The thing about a heavy snow and the city, it's not dark out. It's gray because of the reflected light off the street lamps. The snow came, overnight, in 2-3 inches per hour and was propelled by 30-40 mph winds. The plow had gone by before I got home at 1:30 but I did not hear it again until around 10:45 p.m. I heard it twice this morning around 8 a.m., but have not heard it since. People were out by 8:30 this morning. The whine of snow blowers was everywhere around me. It was still snowing hard when I got up but ended by 9 and was sunny by 10:15. It is gorgeous out and I heard a cardinal singing before I went in. I have compiled all my snow photos taken so far into an album on Flickr. You're welcome to take a look. There will be more added as I work to get out of the house. I cancelled milk delivery for tomorrow. If I can't get to the front, I am not going to ask a delivery guy to do it. Many adjectives and names will be used to describe this storm. I think back to the January of 1971 snowstorm. We didn't have a snow blower. We had shovels. The kindness of a neighbor to come plow us out made getting out a bit easier. It makes for great stories when we're sitting around a picnic table on a sultry July evening wishing it was cooler.